There is no question that advances have been made in cosmetic surgery generally over the past decade to make plastic surgery faster, safer, and easier with respect to comfort and recovery. Although I can now postpone facelift and neck lift surgery for my patients for a number of years with non-surgical “liquid facelift” procedures involving injectables, eventually many come to that point where they want a more substantial “lift” than injections and other non-invasive procedures can provide, even when administered by the most qualified plastic surgeons. In both Toronto and Mississauga I get the same questions: Will I be out of commission for weeks? Will I have a large scar? And most importantly, will I still look like me? Will I look “tight” like Joan Rivers? Fortunately, due to the latest advances in facelift techniques, recovery is faster, scars are shorter, and you will still look like you, only younger and better rested. You won’t look tight, and you will look natural. This is because I don’t do facelifts the old-fashioned way. Where we used to do big, invasive procedures that involved separating the large sheet of connective tissue that covers most of the middle and lower face from the underlying tissues and then lifting it up, I now do less invasive work. 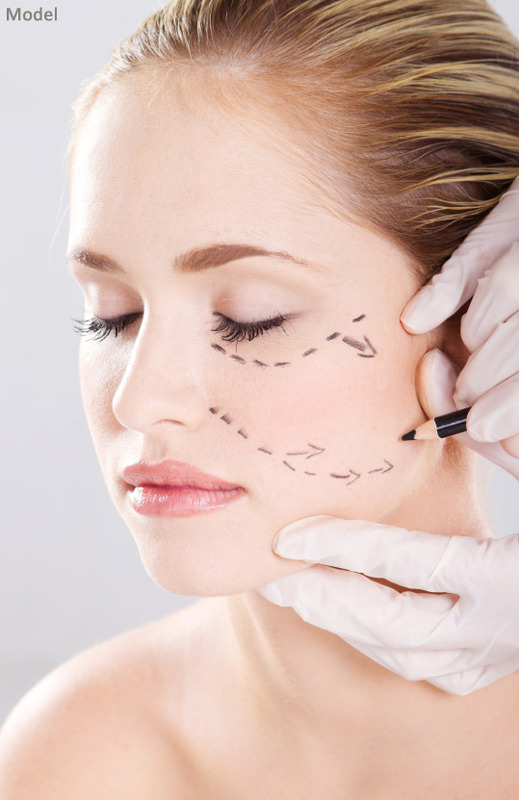 This involves a small incision that is well concealed and fine suture work that involves “placating” or folding the connective tissue of the face, then stitching it to itself. This allows for lots of lift of sagging cheeks and hanging jowls, with less trauma and therefore less bruising. There is also much less risk of any damage to the facial nerves. This has the added benefits of giving more volume to the cheek, as well, in contrast to more old-fashioned methods that gave lift but did not give any added volume to already thin faces. People therefore used to look tight and also gaunt. Now they look fuller and more natural. Volume can be further restored with fat grafting, or other fillers, in combination with, or after facelift for a beautiful result!